When the Terminator returns to movie theaters with a new sequel, Arnold Schwarzenegger’s killer robot will be sharing the action with a familiar face: the original Sarah Connor. According to The Hollywood Reporter, Linda Hamilton is reuniting with creator James Cameron for the latest installment of the sci-fi franchise — the first for both of them since 1991’s Terminator 2: Judgment Day. 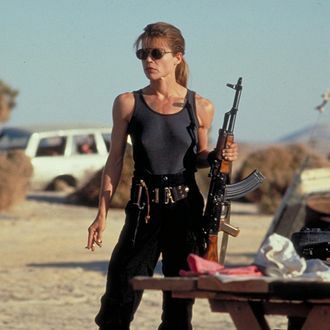 Cameron previously expressed his pride in the Sarah Connor character and her place in the movie canon earlier this summer, while criticizing Wonder Woman. He referred to the character played by Gal Gadot as an “objectified icon,” and argued that Connor was in comparison a more nuanced character. “[Connor] was strong, she was troubled, she was a terrible mother, and she earned the respect of the audience through pure grit,” Cameron said at the time. Though the details are scant on the upcoming film, Cameron did reveal that the film will be a sequel to Judgment Day. Deadpool filmmaker Tim Miller is set to direct.